Hellen Keller International’s (HKI-nonprofit & development organization) ChildSight project in Son La, Vietnam, funded by Mécénat Servier, was officially announced on 11th September 2018. 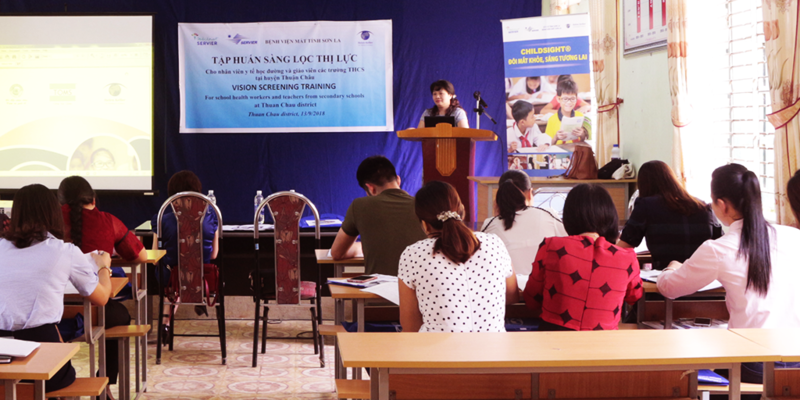 This project aims to bring chances for underprivileged children for treatment of eyes diseases and to establish a sustainable vision care services system by connecting Vietnamese Health & Education Departments. From May 2018, Servier Vietnam worked closely with HKI and local partner (Son La Eyes Hospital) to obtain approval from Son La provincial government to ensure the project meets its goal & objective. In the up and coming months, Servier Vietnam will accompany with HKI to implement the following activities: providing necessary ophthalmology equipment and support to establish hospital optic shops; improve capacity of ophthalmological human resources; conducting vision screening; implementing refraction; providing quality subsidized/free eye glasses; counseling and support for referral; Follow-up checking and implementing communication activities. “This is a purely human project to save children visions and especially ethnic minority people. During this 1st project in Son La, all participants show their eagerness to work together happily” told Dinh Diem Trinh, Servier Vietnam. With the support from Mécénat Servier, it is expected that more than 9,000 students and teachers from 22 project schools will be screened, and approximately 1,000 of those will be provided with quality glasses. Through HKI’s ChildSight project, Servier will start for the 1st time the sponsorship skills program.